I've been pretty busy this month moving house twice- we sold mine at the beginning of August, but the people whose house we were buying refused to complete until the end of the month, so we stayed with my boyfriend's mum for three weeks. So between putting all my stuff in storage and trying not to make a mess of someone else's kitchen I haven't done much baking this month! 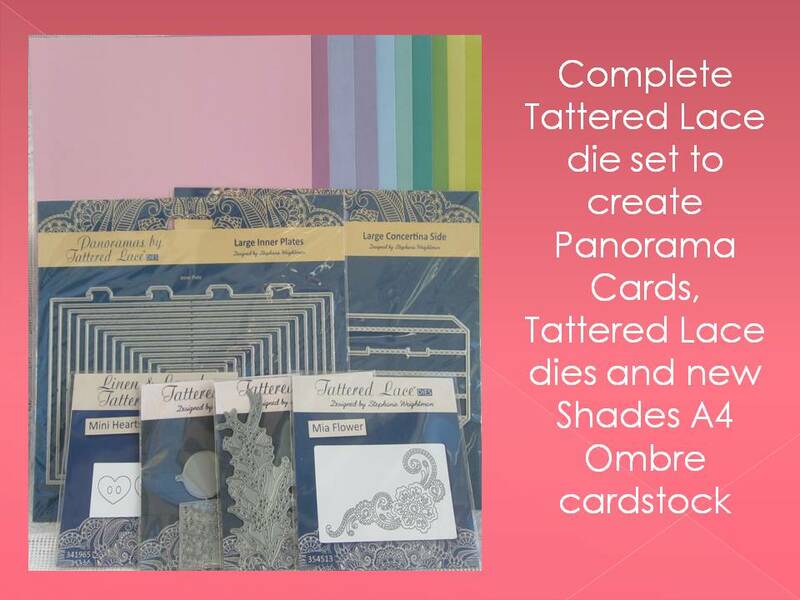 Luckily there are plenty of you who were able to and it was great to see so many entries in a summer month when perhaps you are away on holiday or it's too hot to put the oven on. My mum makes a cake every week almost all year round so this month was no change; here is Jacqueline's peppermint sponge. There is peppermint flavouring in both the sponge and the icing. She also sent a savoury dish, a prawn and smoked fish pie. I love fish pie and this looks like it has cheese melted on top... yum! I went for something very summery after treating myself to Lakeland's new sandcastle cake mould. I thought about what flavours would best represent the beach and went for pineapple and coconut, and decorated the sandcastle with candy melt sea shells (also using a Lakeland mould) and sprinkled golden caster sugar around the edge. So here is my pineapple and coconut sandcastle cake. Keeping it in the family, the next entry was from my sister Clare. 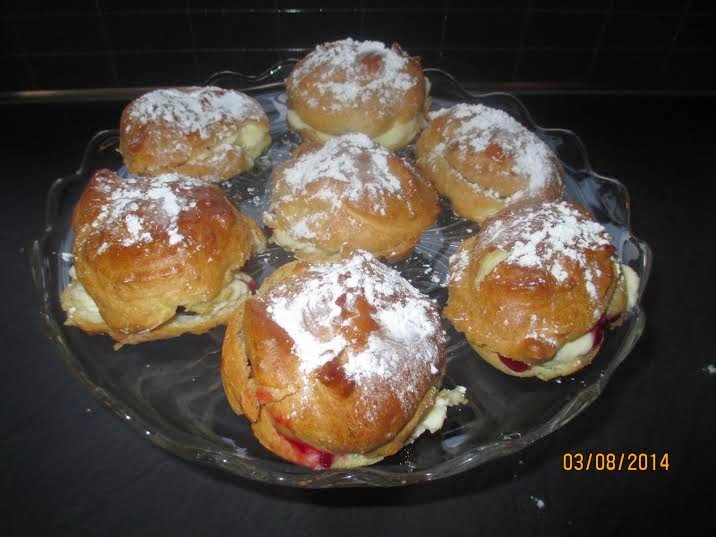 She made cherry profiteroles - I've only ever come across chocolate ones before but think these sound - and look - great. Clare said that the recipe was supposed to make 12 but she only ended up with 6, so they are quite big! My Alphabakes co-host Ros at The More Than Occasional Baker was also packing to move house this month, so like me wanted to get her entry in early, though it now looks like she will be completing on her house in September. She said she baked this and had it up on the blog within an hour! 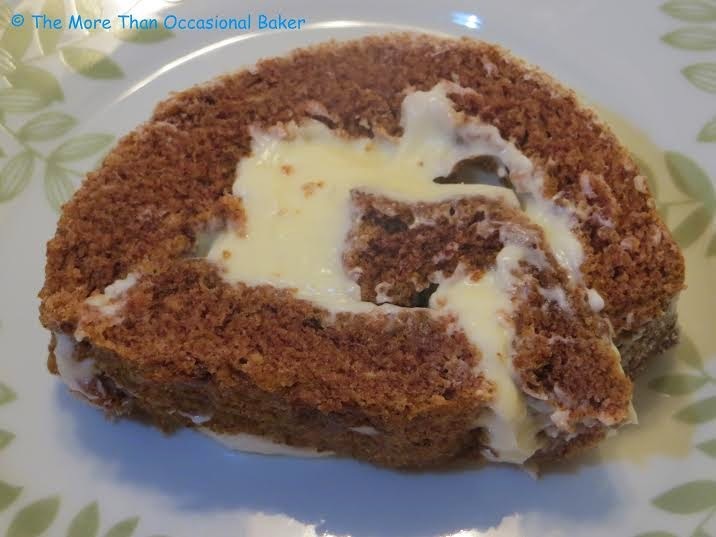 Having recently seen the Great British Bake Off contestants make swiss rolls I think Mary and Paul would be pleased with the spiral on this spiced pumpkin and cream cheese swiss roll. 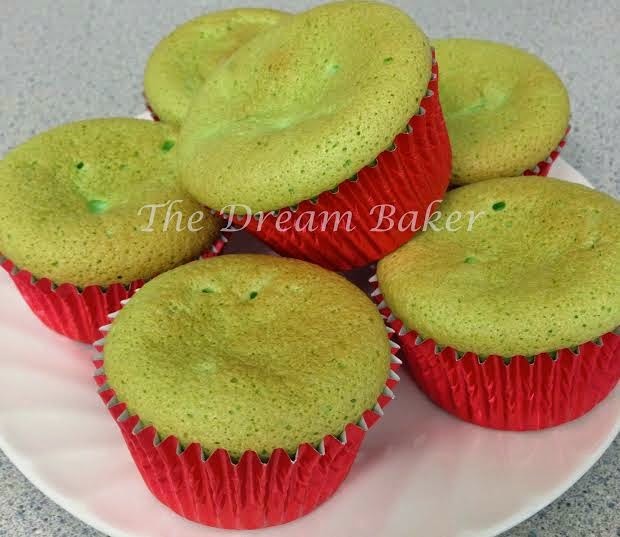 Our next entry comes from Kerene aka The Dream Baker, who made Pandan Chiffon Cupcakes. She explains that pandan is "an aromatic tropical plant that is used widely in Southeast Asia cooking as flavouring (through the use of its leaves or extracts). Pandan is the star component (flavour) of these cupcakes that never fail to remind us of our home, our Singapore!" She now lives in the US and was unable to get fresh pandan leaves so instead created this recipe using pandan essence. Kerene says these are soft and fluffy and I love the colour! Ros at The More Than Occasional Baker realised she had already baked something that began with P, but not blogged about it yet, so now was the perfect time. 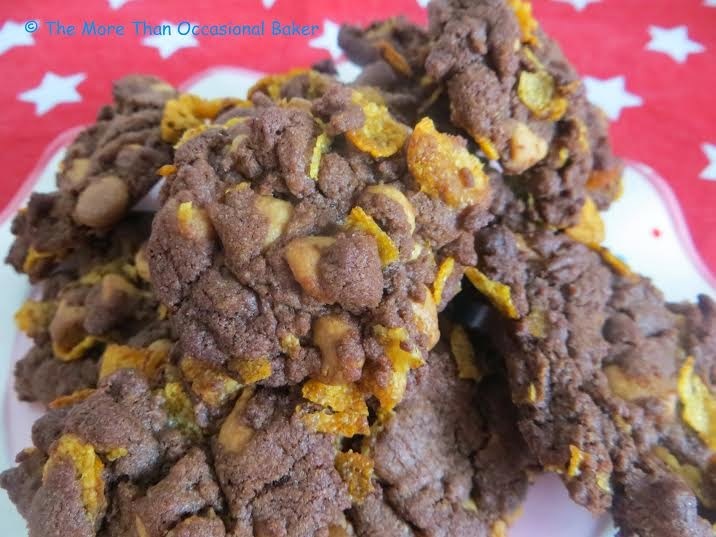 And these dark chocolate and peanut butter cornflake cookies look divine. Ros made them with ingredients a friend brought back from America - which reminds me, my boyfriend's mum is going in a few weeks and I need to put in an order! 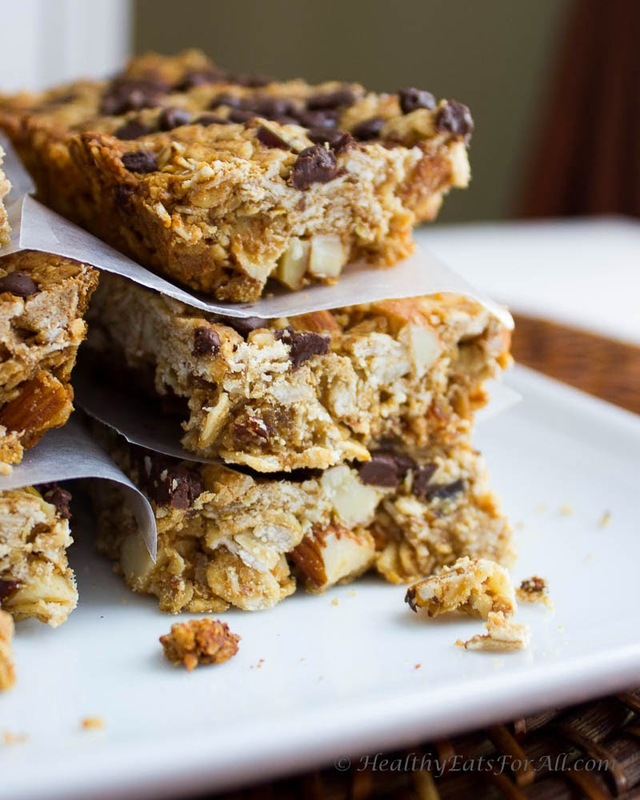 Peanut butter is also the 'p' ingredient in these super nutty granola bars, from Manpreet at Healthy Eats For All. She has experimented with different combinations to make snack bars that are filling, tasty and healthy and points out they need to be the right texture to actually hold together as a bar. I think she has done a really good job! 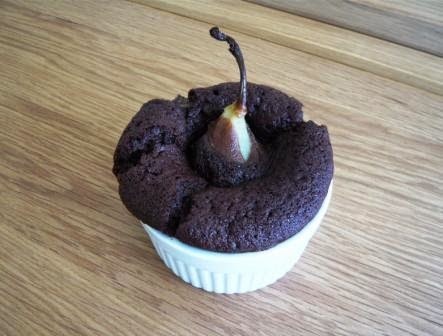 These beautiful pear and chocolate puddings come from Jean at Baking in Franglais, based on a recipe by Rachel Khoo. Jean says the puddings had a gooey middle and the flavour of treacle, one of the ingredients, really came through. These would be a lovely way to finish off a dinner party. 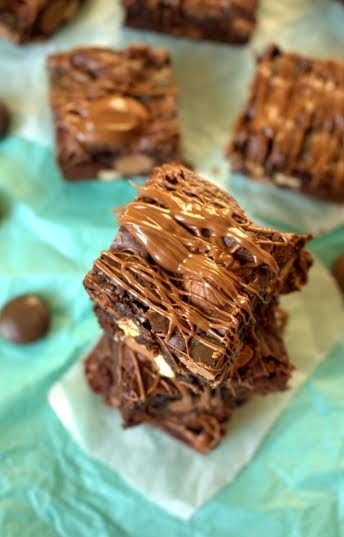 More chocolate now in these Overloaded Chocolate Party Brownies from Laura at I'd Much Rather Bake Than... She made them as a treat for colleagues at the end of a work placement - lucky people! These contain Malteaser Bunnies, Minstrels, Munchies and Nuteella - no wonder she calls them overloaded! More party food! Here's Kate, the Gluten Free Alchemist, with her marshmallow party bites. 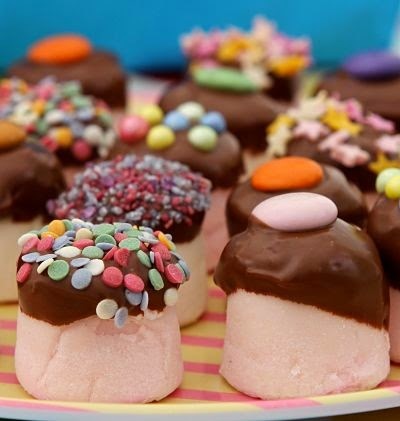 They are very simple to make and you can decorate them any way you like, dipped in melted chocolate and sprinkles or sweets. They would be very popular at a children's party and I think with adults as well! 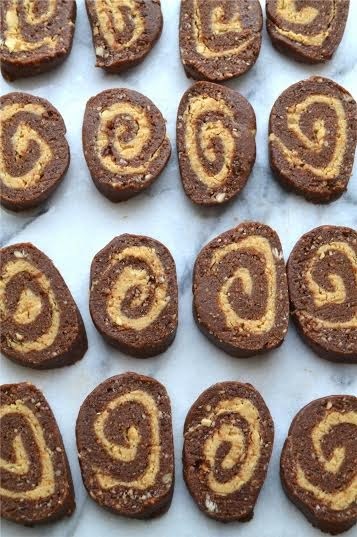 It's nice to not have to put the oven on when you want sweet treats sometimes in the summer, so these no bake chocolate and peanut butter pinwheels from Stuart at Cakeyboi are just the thing. What's more, he says they contain no 'bad fats' or refined sugar so they are a bit higher up the healthy scale than they might be! 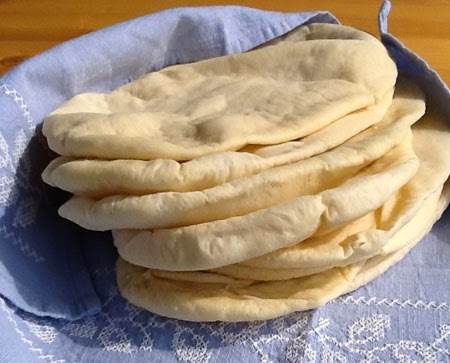 Sarah at Tales From the Kitchen Shed made these simple but perfectly formed pitta breads. I made pittas on a cookery course a few months ago and was amazed at how they puff up in minutes in the oven. She gives loads of helpful tips for how to make them and recommends using them for chicken kebabs - yummy! 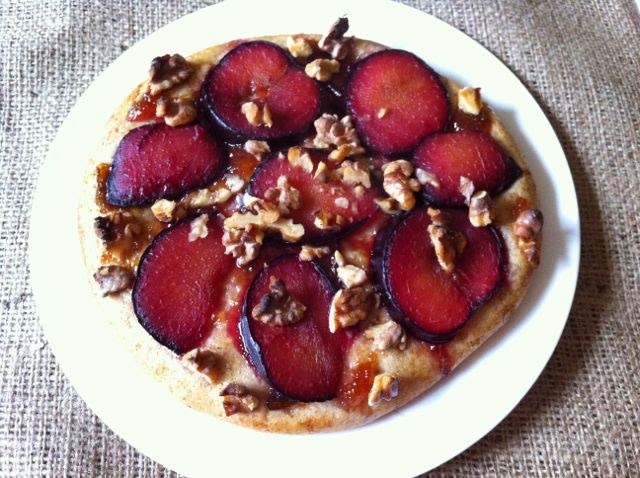 A triple-P entry from Choclette at Chocolate Log Blog with this Purple Plum Pizza. The base is made of pizza dough with the addition of white chocolate and it's topped with homemade plum jam, plums and walnuts. A really creative idea and I bet it tastes delicious! 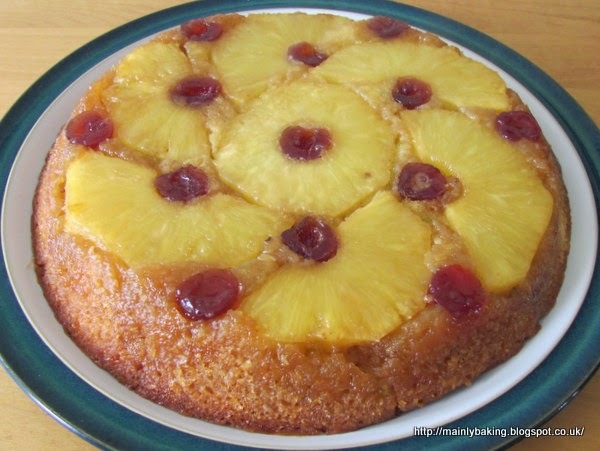 A traditional favourite from Suelle at Mainly Baking - pineapple upside down cake. But she's given it a modern twist by using coconut milk and lime in the sponge, for a really summery flavour. 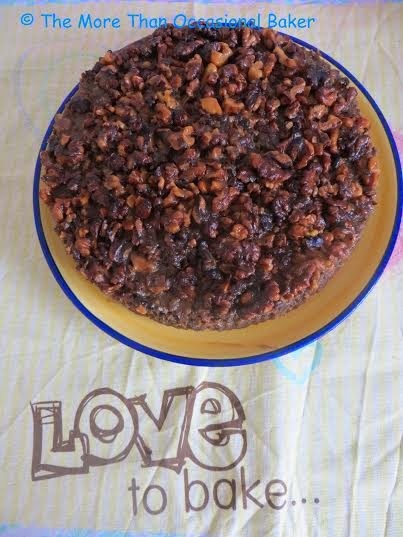 Here's another upside down cake, the second entry from Kate aka The Gluten Free Alchemist. She made this savoury summer upside down cake - that's right, a savoury cake. 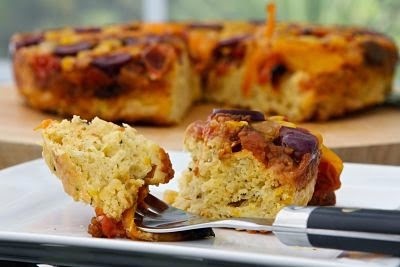 The sponge is made from polenta and it's topped with tomatoes, yellow and orange peppers, olives and sweetcorn. I can just imagine sharing this on a picnic and I think it's a fantastic idea! Another one from my co-host Ros at The More Than Occasional Baker (I thought she was busy moving house - I'm glad she still found time to bake!). This pear and walnut cake has a caramel topping and would be a great way of using up fruit that is a bit too soft. Shaheen at Allotment2Kitchen was forced to harvest some runner beans after bad weather destroyed the plant and made a savoury Sri Lankan Chilli Coconut Runner Bean pie. She says it has heat from the chilli and sweetness from the coconut and is certainly different. She has been quite clever in pointing out that phaseolos coccineus is the Latin name for runner beans so is using that as her P! Runner beans are also known as pole beans in some parts of the world so that definitely counts. P is for pumpkin seeds this month over at Vohn's Vittles. 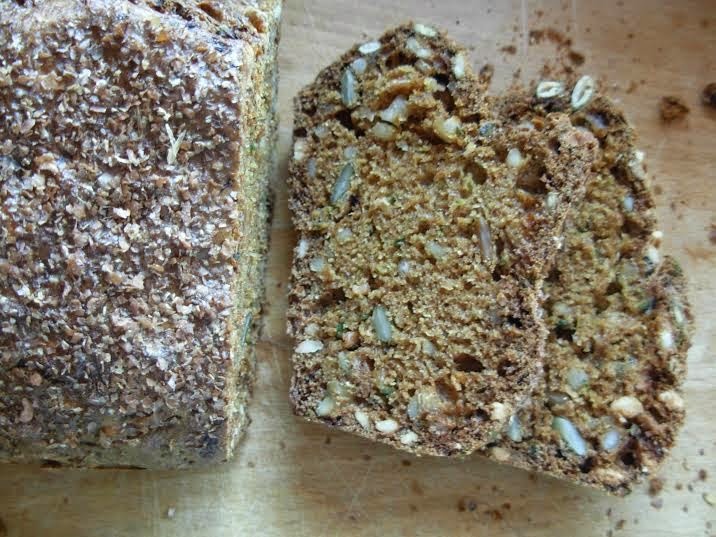 They feature in this spiced courgette loaf which would work as much for afternoon tea as it would for breakfast. It looks pretty healthy and very tasty! 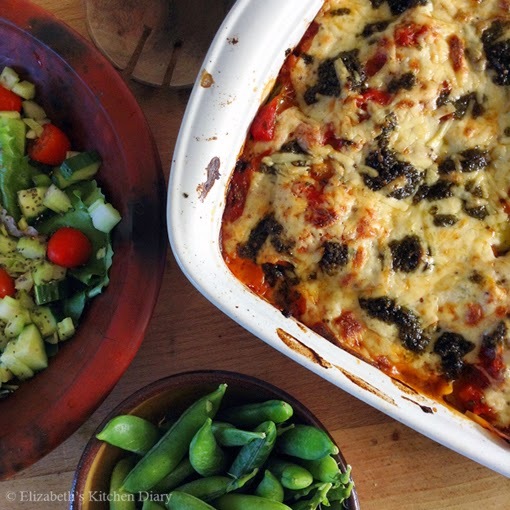 Another savoury entry: this grilled veggie lasagne with wild garlic pesto was produced by Elizabeth of Elizabeth's Kitchen Diary. It's a great way of using storecupboard ingredients including tinned vegetables, and Elizabeth says this is one of the best lasagnes she's ever made. There are plenty of Ps in this- tomato puree, parsley, red and yellow peppers and of course the garlic pesto. 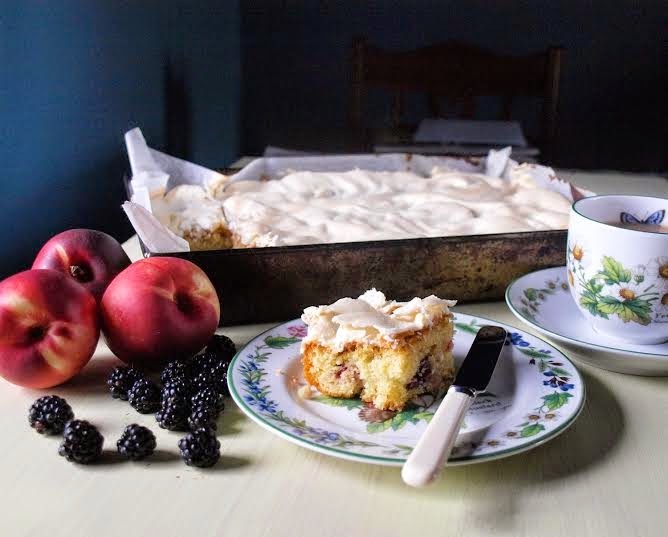 This peach and bramble meringue slice from Janice at Farmersgirl Kitchen came about to use up egg whites from another recipe; she picked the blackberries (brambles) from her farm and says the fruit adds a soft lusciousness and the meringue a light crispy texture. I'm keen to try this one! 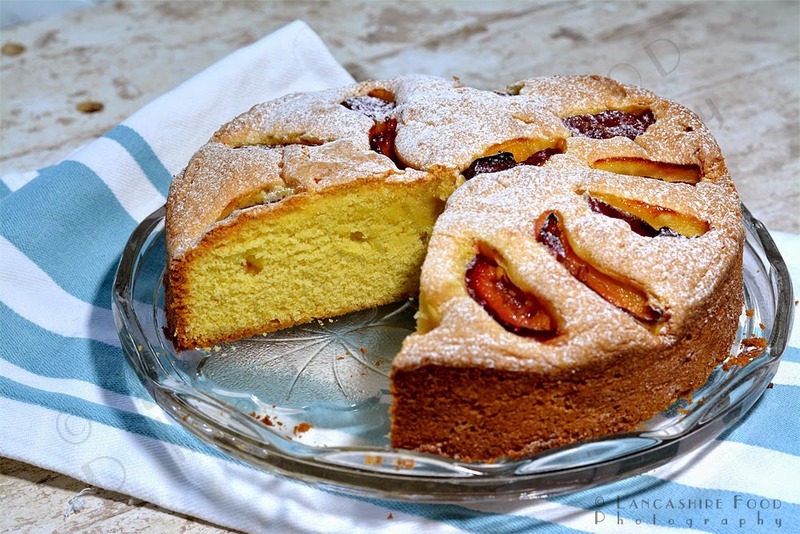 Another rustic countryside style cake now: Linzi from Lancashire Food has made this plum and cornmeal cake with plums from her own tree. The cake is gluten free and needs little embellishment or decoration other than a light dusting of icing sugar. It looks like the kind of cake you need when you've been working outdoors in the garden all day. 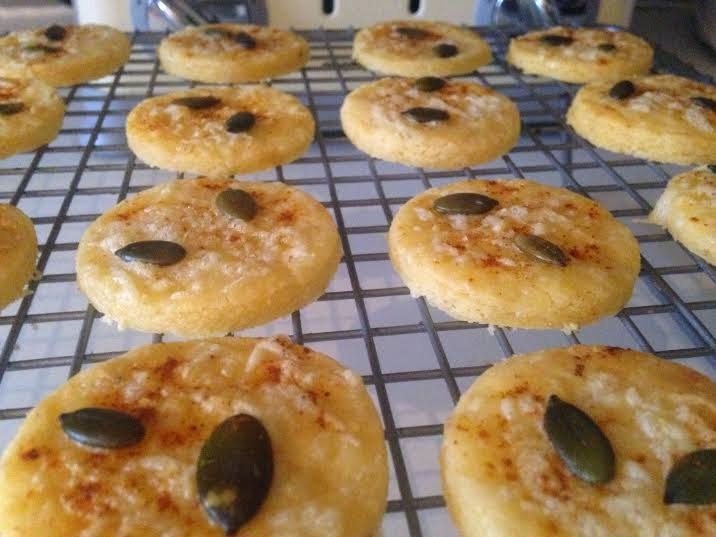 Corina at Searching for Spice made these parmesan and basil thins inspired by biscuit week on the Great British Bake Off. 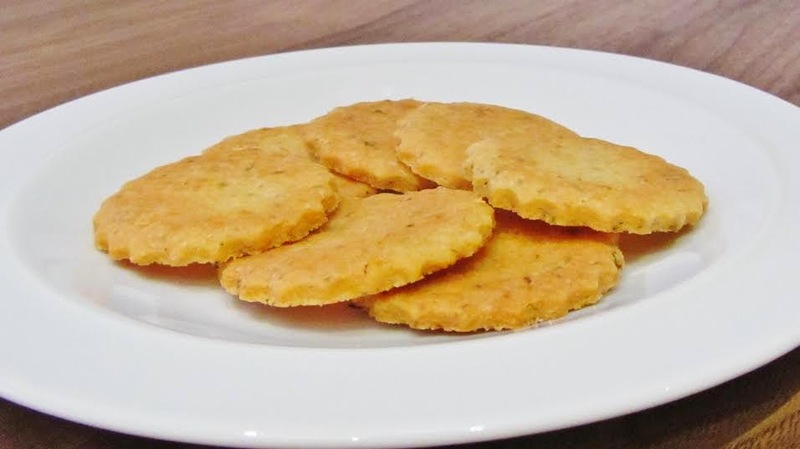 They are cheesy and crispy and I think would be just as good eaten on their own as they would be eaten with cheese. Here are some more savoury cheese biscuits, from Fiona at Sweet Thing You Make My Heart Sing. She's treated us to these pecorino biscuits, again inspired by the Great British Bake Off. 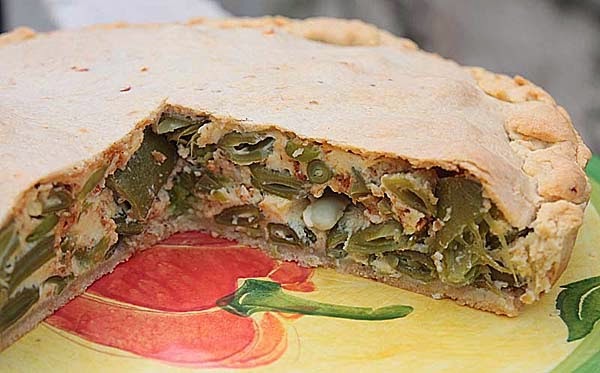 They also have pumpkin seeds on top, and look very tasty. She's also celebrating handing her thesis in - congratulations, Fiona! 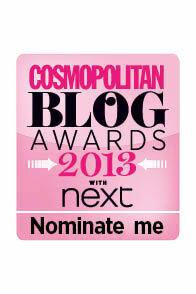 The first of two last-minute entries from me now which I blogged at the end of the month. I've often had physalis as the decoration on a dessert in restaurants but had never eaten it; I bought a bagful in the supermarket for only £1 so decided to incorporate it into a cake. The result was deliciously moist, probably thanks to the yogurt, in this physalis cake on Caroline Makes. I also made a passion fruit and mango puree bread pudding (also featuring mixed peel), inspired by Penny's Passion Pudding from a book called Sweet Nothings by Sheila Norton. It was an unusual and delicious take on the traditional dessert. Johanna from Green Gourmet Giraffe used potato flour for this gluten-free pastry, which she used to make an apple slice and some sausage rolls for her niece's party. Both of them look delicious and from the other photos it looks like they had a really fun day! And finally, a great cake to end the roundup on as it comes from my co-host Ros at The More Than Occasional Baker . Ros is a huge fan of peanut butter and made this chocolate and peanut butter cake using Reece's Cups. It has a layer of peanut butter inside and I've already bookmarked it as one I want to make! Check out her blog on September 1st to find out which letter we are baking with next month! Thanks to everyone who entered, see you soon! Great round up! There are some really special and innovative recipes here. Wow!!! Thanks for hosting.